Since the Fourth Lateran Council ruled that all Christians were to go to confession at least once a year during Lent, and long before, Christians have been observing this Season. Time flows on and the Church Year rolls around. Here we are, once again. So then, that is the question. How will I follow Jesus, as He spends forty days in the wilderness? My life seems pretty calm just now, but even in relative peace I know He has walked this path before and along side as I walk my journey. "THE cross, with which the ashes are traced upon us, is the sign of Christ's victory over death. The words "Remember that thou art dust and that to dust thou shall return" are not to be taken as the quasi-form of a kind of "sacrament of death" (as if such a thing were possible). It might be good stoicism to receive a mere reminder of our condemnation to die, but it is not Christianity." So then, there it is, how will I follow Jesus, as He spends forty days in the wilderness? How will you, my readers? What spiritual practices will you pick up this Lent, what distractions will you shed? May the ashes of this Wednesday will be to all of us a sign of our mortality and penitence, and also a reminder that only by His gracious Gift that everlasting Life is promised anew; through Jesus Christ our Savior. Amen. Isn't it interesting that those colorful Sunday advertisements don't seem to pick out Lent like they do Valentine's day or Christmas as a time of sales and commercialism? Perhaps a theme of penitence, contrition and self-examination doesn't sell many new clothes or other products. I think it is interesting that in the Scriptures we see God talking to us of feasting often. God seems to be a party goer and is constantly inviting us to join the merriment. I think sometimes it is us humans that are the party poopers. Insisting on being 'right' and forgetting that this amazing God of love we serve showed forth His first miracle at a wedding party! Enjoy today, put on your mask and party hat! I wonder how many of my readers out there have ever walked with Jesus in this Journey known as Lent? If so, have you considered how counter-cultural this is? It doesn't seem to fit the glittering cathedrals of prosperity we have made of most of our lives. I feel that much of modern American Christianity is focused on what can we get from God, how we can be blessed, how we can prosper in material ways, as good middle class people should. Lent helps me to focus on another way, a conscious and deliberate retreat from our so-called "Christian" culture. Soon ashes will be imposed on our foreheads and our Lenten disciplines traditionally begin. I see that moment as a kind of doorway into a space in time that calls us to stop whatever we are doing, no matter how important it might be, and enter more intentionally into the disciplines of prayer, self-examination and repentance. This is an entering into the historicity of Jesus, and His story. We can walk and fast as He did, with Him. Consider this time, step through that doorway into specific intentionality, come follow Jesus these 40 days of fasting. On this last Sunday in Epiphany, we remember and celebrate the radical change in appearance of Our Lord Jesus Christ, while in the presence of Peter, James, and John, on a high mountain. The Transfiguration revealed Christ's glory to His disciples, in shining splendor of Uncreated Light. For a moment the veil is drawn aside, and men still on earth are permitted a glimpse of the heavenly reality, the glory of the Eternal Triune God. The Transfiguration of Christ is recorded in the first three Gospels (Matthew 17:1-9; Mark 9: 2-9; Luke 9: 28-36). The fourth does not contain an account of the event, but John, being one of the three witnesses, is probably referring specifically to it in 1:14. The Apostle Peter also recalls his (as well as James’ and John’s) presence with the Lord on Mt. Tabor: in 2 Peter 1:16-18. Often in the Scriptures we see images of the Light of God, the energies emanating from the Triune Being. This Light is not part of our creation. It is Uncreated, just like God is Uncreated. It comes from God and it existed before the Universe was created. Moses saw it on Mt. Sinai, and this is the Light that floods the City of God in Rev. 22. In the Transfiguration, we along with the disciples present see the glory of the Kingdom of God present in majesty in the Person of Christ. They see that in Him, all the fullness of God was pleased to dwell. They see this before the crucifixion so that in the resurrection they might know Who it is; Who has suffered for them, and what it is that this One, Who is God, has prepared for those who love Him. When we pray for those who no longer live in this world, we ask that God's "perpetual Light would shine upon them." May that Light, Uncreated since before the world began, shine on us also. God our hope and joy, You transfigured Jesus on the holy mountain and strengthened Him for the travail and death that was to come. Please shine in and through our lives, that in happiness or in travail, we may celebrate with faith and serve You with willing love. Through Jesus Christ our Savior, Amen. He saw a poor widow put in two copper coins. but she out of her poverty put in everything she had. I wonder, did she ever know that He noticed her gift? Do we notice the gifts of others around us, be they ever so small. I assure you, He sees each and evey tiny offering of love, especially those that escapes our coarse, hardened viewpoints. Can anyone share a small gift that changed their own or someone else's life? Please pray for all those affected by the bushfires in Australia at the moment. Very strong winds and incredible heat converged to cause the worst fire disaster in recorded history yesterday. Many people were killed as they tried to evacuate, including six members of a family in one car. 108 people are reported dead, this will rise significantly as emergency services gain access for the first time to whole towns which have been destroyed. The worst fires have been in Victoria, including in Bendigo which is the centre of one of the Anglican Dioceses. Please pray for Bishop Andrew Curnow and his people there. Lord, we pray not only for those whose homes and loved ones have been lost or injured in the fires of recent days, but also for those whose faith has been shaken; for those who stand bewildered and fearful in the midst of this tragedy; for the injured, the bereaved, and the destitute. We commend to Your grace all who are seeking to help and heal the injured, and to comfort and calm the bereaved. From You alone can come the word that will lift them above their darkness. Answer, O Lord, the question in their minds; and assure them that though disaster is not of Your will, You are present with them in their suffering and sorrow, and can enable them to find purpose, hope and peace again. Accept our compassion for the suffering; bless those who are working for their relief; and show us what we can do to share in their task, as servants of Jesus Christ our Lord. The Christian faith was first introduced into Japan in the sixteenth century by Jesuit and later by Franciscan missionaries. By the end of that century, there were probably about 300,000 baptized believers in Japan. Unfortunately, this promising beginning met reverses, brought about by rivalries between different groups of missionaries and political intrigues by the Spanish and Portuguese governments, along with power politics among factions in the Japanese government itself. The result was a suppression of Christians. After a short interval of relative tolerance, many other Christians were arrested, imprisoned for life, or tortured and killed; and the Church was totally driven underground by 1630. O God our Father, Source of strength to all Your saints, Who Brought the holy martyrs of Japan through the suffering of the cross to the joys of life eternal: Grant that we, being encouraged by their example, may hold fast the faith we profess, even to death itself; through Jesus Christ our Lord, Who lives and reigns with You and the Holy Spirit, one God, now and for ever. Amen. This post is from my friend, Father John's blog, it spoke a lot to me on my own journey as a widower, may it speak to you as well. The morning routine begins with a cup of coffee, let the dog out, a quick glance over the headlines, let the dog in, and then off to get ready for another day – shower, dress, etc. As long as I keep the routine I can leave the house with relative confidence that everything is in order; however, if I brush my teeth before I comb my hair then there is a good chance I’ll forget to shave. I think it has something to do with not enough coffee. But, as I say, if the routine is followed, then I can walk out into the world and no one will be the wiser to the wounds and scars on my soul. I am a master of disguise and so are you. Emotion is bad. Feelings are personal. Opinions and judgments are a dime a dozen, but when is the last time you opened up your soul and shared it with others? Truth is we all have wounds; some are fresh while others have healed. That great Roman Catholic Priest Henri Nouwen wrote, "Nobody escapes being wounded. We all are wounded people, whether physically, emotionally, mentally, or spiritually. The main question is not ‘How can we hide our wounds?’ so we don't have to be embarrassed but ‘How can we put our woundedness in the service of others?’ When our wounds cease to be a source of shame and become a source of healing, we have become wounded healers." Our Lord Jesus did not hide his wounds. He held them out for Thomas and the entire world to see and it is through those same wounds that he healed us. He “brought us out of error into truth, out of sin into righteousness, out of death into life.” (Book of Common Prayer, 367) Through his actions, Jesus has shown us how we too might take our wounds and also bring healing to a wounded world. Therefore, if you are one of those disguised wounded, don’t be afraid to show your soul to a discreet and caring person. You are not alone in the struggles you encounter. However, if the Lord has healed your wounds then make yourself available to others who might benefit from the wisdom God has given you and become a wounded healer. P.S. 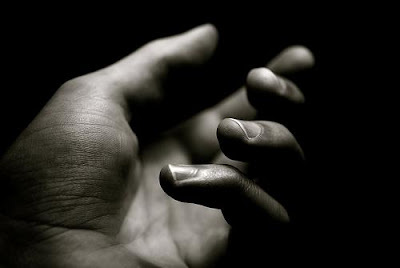 If you are wondering who might need God’s healing touch, then may I suggest the next person you see after reading this article. Starting at the Feast of the Nativity (December 25) you come to February 2 as the Fortieth Day since the birth of Jesus. 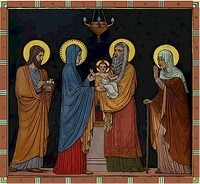 In those days, a Jewish woman stayed in semi-seclusion for 40 days after giving birth to a son, therefore on February 2 the Church celebrates the coming of Mary and Joseph with the infant Jesus to the Temple at Jerusalem to offer sacrifice, both on behalf of Mary and on behalf of Jesus as a first-born male. Joseph brings two turtledoves as a sacrifice, since they were a poor family Had they been more well to do, then a lamb would have been required, perhaps a bit of progressive taxation as designed by God. Be that as it may, as they entered the Temple, they were greeted by the aged Simeon and Anna. Many people feel that Simeon and Anna can represent the righteous waiting for Israel's redemption, and rejoicing that they lived to see the day of Jesus' presentation. Both of them are presented as elderly - Simeon waiting to die and Anna, 84 years old, wrinkled living in the Temple. Guided by the Holy Spirit, these two utter oracles concerning the redemption and consolation of Israel. Simeon's first oracle has become the Nunc dimittis, sung at Compline or night prayer by Monks and other Religious throughout the ages. There is an old reading for this day that contains the line (Zephaniah 1:12), "I will search Jerusalem with candles". This is how it also became known as Candlemas, and is sometimes observed with a candle-lit procession. Almighty and ever-living God, clothed in majesty, Whose beloved Son was this day presented in the Temple, in Substance of our flesh: grant that we may be presented to You with pure and clean hearts, by your Son Jesus Christ our Lord, Who is alive and reigns with You, in the unity of the Holy Spirit, one God now and for ever.